I recently sat down with Rick Martinson, owner of Winter Creek Restoration, to discuss Biophilia as it relates to landscaping. Biophilia is a philosophy based on the bond between human beings and other living systems and while it has gained some traction in the architectural industry, it only just beginning to be explored as a methodology for landscaping. Tom and Barb have certainly embraced the principals of biophilia for the entire Desert Rain project. To someone unfamiliar with the concept, its application in landscaping is a great starting point. Whether you have had a chance to chat with Rick and his team from Winter Creek at Desert Rain, or you have run into him at your favorite local coffee shop, it only takes a moment to understand that Rick is intensely passionate about the relationships between plants and people. But when pushed to winnow the philosophy down to a few key points, he happily offered these 3. It’s not the current norm to give considerable thought to how each created landscape functions as an ecological and integrated system. Most frequently, we see landscapes that have been designed solely as an aesthetic component of a built environment. But if we look at the landscapes of our homes, businesses, and municipal spaces with a perspective based in biophilia, we can see that landscapes are functional systems. Rick offers the analogy of a traditional zoo. Until recently, zoos were a collection of exotic creatures living essentially together, but never really interacting. When we plant trees and shrubs merely for their aesthetic value, it is easy to neglect to understand how they will interact together. A landscape that is designed as a dynamic system considers not only the broad climate of site, but also the effects of the system on wildlife habitat, soil condition, water and air quality, and human health (mental and physical). Using a biophilia methodology requires that we consider how the plants selected will interact with each other, how they will be affected by the space itself, and what they will contribute to this created environment. Plants, soil bacteria, and fungi work together to create shade, conserve water, access nutrients, to ward off disease, pests, and even survive natural disturbances like droughts and floods. Landscaping elements can be divided into functional groups (trees, mosses, grasses, shrubs, fungi, etc), each occupying a specific environmental niche. Each group is made up of a huge variety of species. When you increase the number of functional groups as well as the number of species within groups, you do something amazing for your landscape or created environment. Plant group and species diversity with plant density increase nutrient cycling at a microbial level. This means the landscape system is able to feed itself without the use of added fertilizers. Biodiversity increases ability of the landscape to survive pests invasions. Because most insects and diseases are plant specific, an infestation will only affect one or two species within a diverse plant palette. A rich plant pallet will attract a greater variety of birds, mammals, and insects. This, in turn, helps spread native plants that will contribute to and thrive within the landscape system. While this richness may seem novel, it also creates a landscape that can take care of itself. A thoughtfully created environment becomes one that changes and adapts to disturbances and contributes to all beings’ welfare (including humans) rather than being a tax upon others. You may look around your hometown and note that many of the plants you see are the same – surmising that these plants do well in this climate and therefore are the best choice for your landscape. That may lead down the wrong path. Often, landscape designers and installation companies work with the same small plant palette. In fact, across the country, a similar, narrow plant palette is used regardless of the landscape location. You may also look around the wild or undisturbed areas near you and see very similar plants. A wild space near Madras, Oregon may look a lot like a wild space near Brothers, Oregon – a sage field with juniper. What you don’t see are the differences in the understory. For example, the understory of both of these locations include buckwheats, but they are actually different sub species specific to the slightly different rainfall and soil types of the areas. Choosing the right plant for the environmental conditions in that site is crucial to creating a healthy functioning landscape system. Choosing the right species and sub species reduces the resources needed to get them to work as a system and increases the success rate of the landscape. 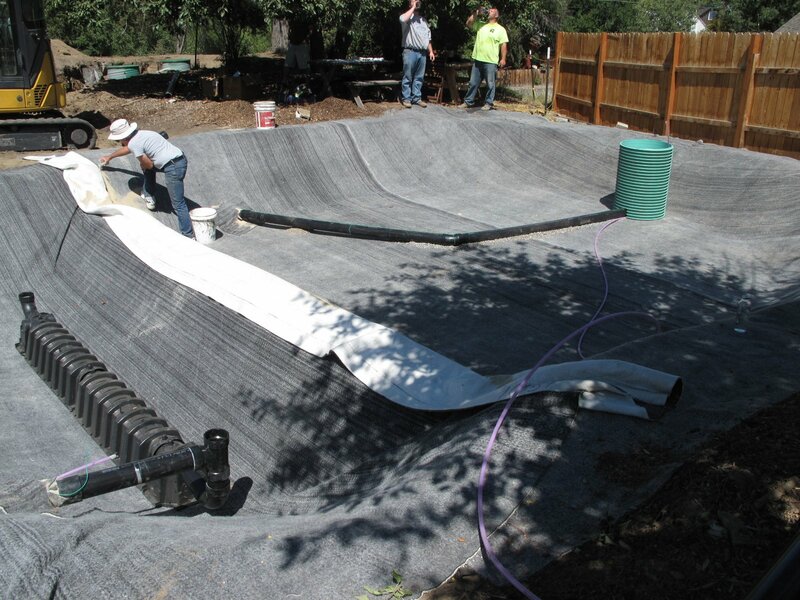 Even a carefully created landscape will need some support (water, mulch, etc) when it’s first installed. After about 3 years, the system will have created small micro climates, established networks between the fungal communities in the soil and the plants, and will be able to take care of itself. Whether you are considering a new landscape or are just interested in learning more, you can conduct your own research project that will give you a richer understanding of where you live. Identify your eco region and identify the plant associations within your specific eco region. First, find your eco region (level 4*) by using this map. This is very different than the USDA growing regions that you may be familiar with. Next, you’ll need to identify native plant associations. You can start by looking for a reference community – an undisturbed space within your eco region that shares similar features (rocks, shade, exposure to sun, etc). You can use online resources like native plant societies in your region, survey maps from the 1800’s, and GLO maps. You’ll soon realize that this is not an easy or quick project, but it will be one that is quite informative. Let us know what you discover or reach out with questions. Since Barb and Tom moved in to their new home earlier this year, we’ve had many requests for pictures of the finished interior. While aspects of our project are still underway and we will be taking many more photos in the future, we’ve put together a small selection to share with you now. A place to gather and connect: The living room is a place to connect with friends and family as well as the beauty outside. The warmth of the reclaimed wood makes the kitchen an inviting place to gather. The dining room, just off the kitchen, has windows on three sides, creating an openness and connection with the outdoors. The open floor plan keeps the kitchen and living room connected. Barb and Tom wanted space for guests and space for contemplation. This room can be used for either. Small spaces like this bench in the hallway create a space to reflect and find solitude within the openness of the Desert Rain floor plan. Since December, Desert Rain has been home to Tom and Barb. They are settling in, becoming familiar with the uses and mechanics of the many systems that are part of the site and structures. Last week the installation of the control panels was underway. When the work is completed the status of those systems will be visible data that may be used to monitor and optimize efficiency. The Control Panels will monitor the hot water temperature and energy produced by the solar thermal and photovoltaic modules. To receive Living Building Challenge certification, Desert Rain must meet a series of rigorous performance requirements. For a minimum of 12 months of continuous occupancy the data will be archived to determine the effectiveness of the working systems installed at Desert Rain. The permit is still pending for Desert Lookout, a structure that will have a dwelling space and house the proposed composter/evaporator system for blackwater and dishwasher waste. The clock will not begin until all systems are in place and functioning. The maze of wires and components in the control panels. 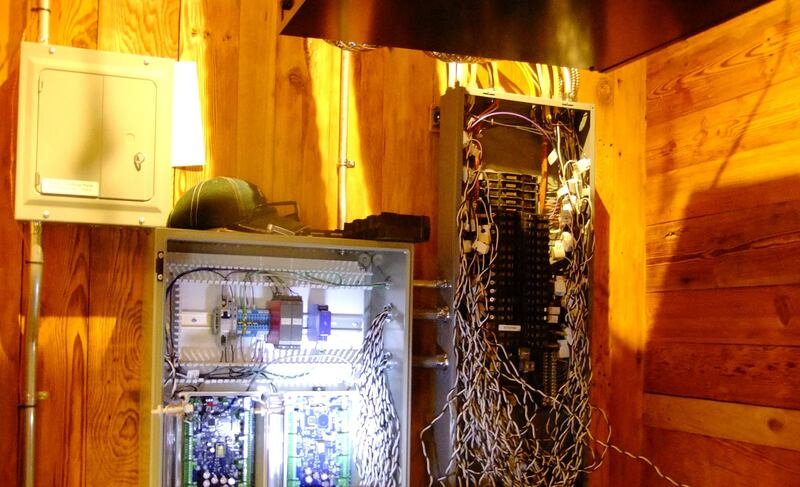 Powers of Automation a local, family oriented, Bend company designed and built the control panel equipment. President and founder, Steve Powers said this is the first residential project they have been involved with. They typically provide control and validation solutions to municipalities and large scale industrial companies. He had not heard of the Living Building Challenge when he was referred to the Desert Rain Project through a parts supplier. He looks at this project as a potential way to diversify his business. 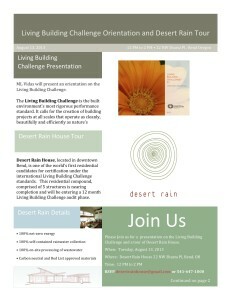 Desert Rain will be sharing information about the monitoring systems and results with the Living Building Challenge community. The Control Panels will monitor flow and levels in the constructed, bioreactive wetland, grey water tanks, and the irrigation system. The 35,000 gallon fresh water cistern and distribution system will be monitored for level and flow. Two pumps will be utilized alternately and monitored by a pressure sensor that will adjust speed to maintain desired pressure. Once the LBC monitoring phase begins, water in the cistern may only be replenished by collection through rainwater harvesting. The LBC allows the fresh water cistern to be charged initially by filling with city water. There are 7 pumps in use throughout the systems at Desert Rain. Each pump will be monitored and connected to an alarm/warning system in case of failure. The grey water, bioreactive wetland, reclaimed water tank, and irrigation system will be monitored by a flow sensor to determine efficiency of water flow and track evaporation. Flow meters and level controls will assure there are no water overflows by alerting Tom to water levels and allowing to re-adjust set points. Dan McCullough, Project Manager with Powers of Automation in ‘Mission Control’ room. 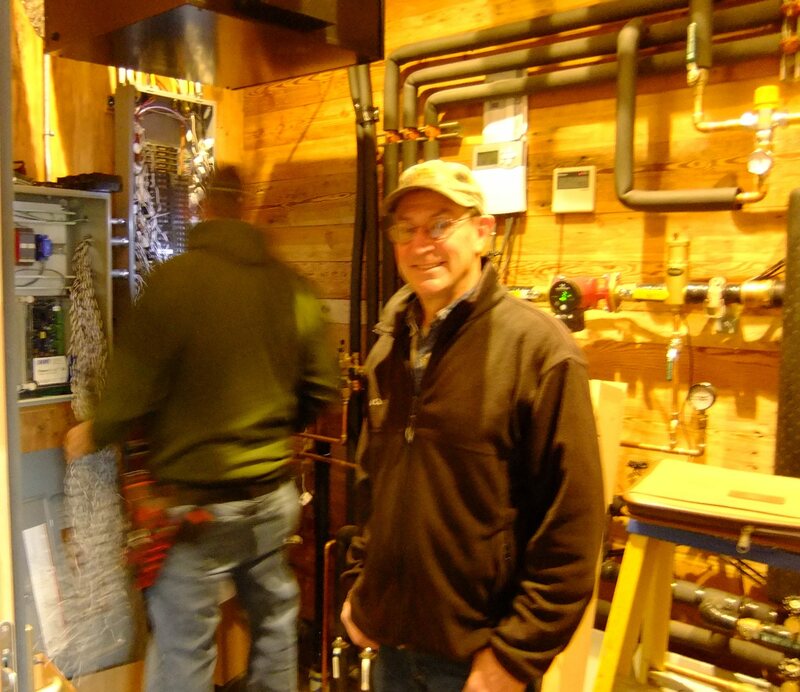 Mike Wagnon, electrician with All Phase Electric Service works on installing the control panels in the background. 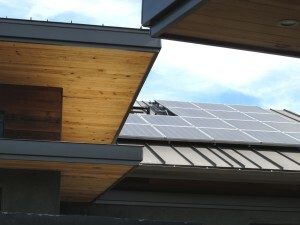 For LBC certification Desert Rain must be net zero energy. The solar photovoltaic system is monitored with web based software. The power production is monitored and the data archived. Power consumption will be monitored at individual and grouped sources to determine what is using energy and why. The temperatures and/or energy use of the hot water, air to water heat pump, hydronic radiant floor heating system, and electrical circuits will all be visible with the control panels. When completed, the composting, evaporator, and vaccum system will be monitored for levels and alarms before any overflow could occur. The evaporator tank and reclaimed water tanks each have an overflow connected to sanitary sewer. Any over flow could invalidate the LBC water petal certification. In addition to systems monitoring, Desert Rain will be outfitted with a weather monitoring station that will track barometric pressure, dew point, temperature, relative humidity, rainfall, wind speed, and wind direction. Tom and Barb are eager to have the control panels in place so they will have time to watch the systems, determine what is working, and maximize performance before the official monitoring period begins. Tom and a friend will be developing a dashboard to graph the information so it may be more easily viewed and eventually shared. All the research, design, development, and installation of systems will be under scrutiny as the data tells the story. Desert Rain will be playing the role; as a home, and as a demonstration of sustainability in the built environment. The top of the posts of at the Chinese gate are carved with symbols representing yin yang. 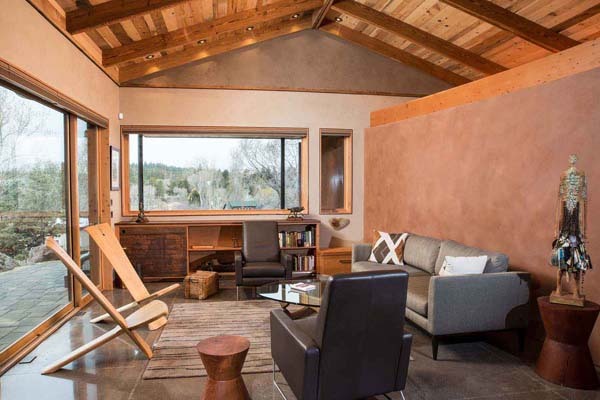 When a circa 1949 potato barn in Prineville, Oregon was under deconstruction, tranquility and harmony were not the words to describe the process. 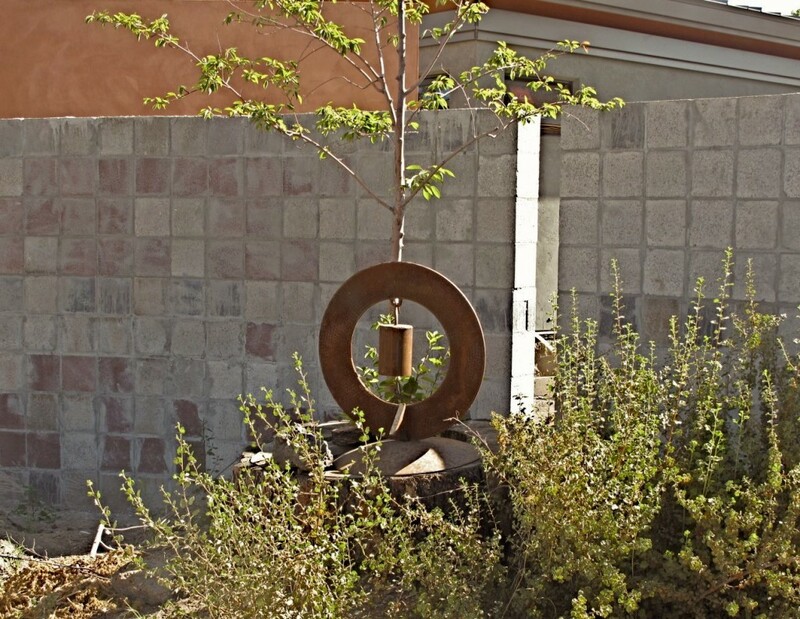 Three years later, under the thoughtful eye and hand of woodworker, Andrew Scott, the reclaimed lumber from that potato barn is creating tranquility, harmony, and beauty in the Desert Rain landscape. Scott is using the reclaimed wood from the potato barn to build gates and fences that create privacy and frame the views on the site. For the Desert Rain project, he wanted to represent the energy of the Living Building Challenge while respecting the environment, keeping a light footprint, and reflecting the nature of the project. The raindrops carving representing yin – the feminine, softer side. Scott wanted to soften the lines and hard edges of the structures with natural and organic imagery. His background in acupuncture and traditional Chinese medicine and the design of the project inspired his work. 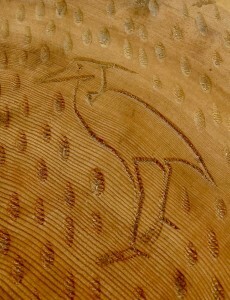 Images and symbols are carved on the tops of the posts – some visible, some out of view unless one knows where to look. The Chinese gate that enters the courtyard is supported by posts appropriately carved with a sun symbol on the right and raindrops or a snowfield on the left. 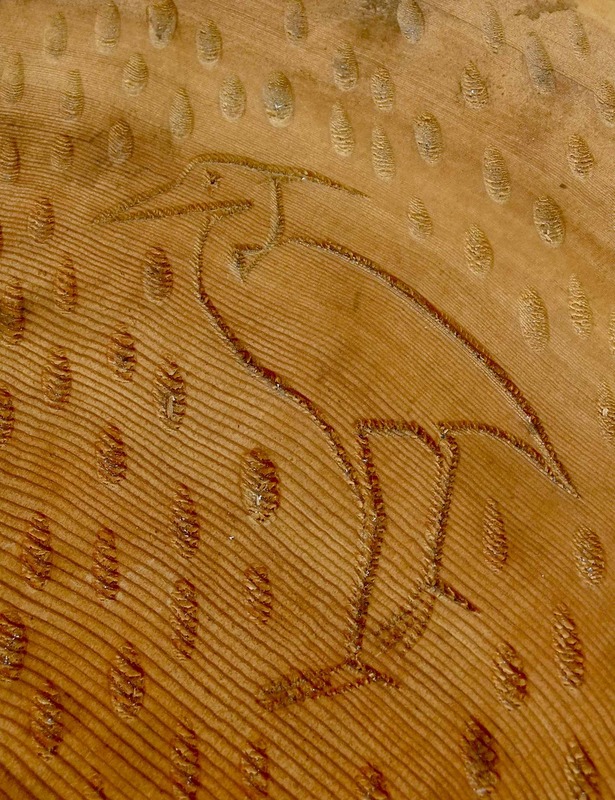 The carvings represent yin yang, a primary guide to traditional Chinese medicine describing how contrary forces are complimentary and interconnected. Simplified, the yang side is male, fire, light. The yin side is earth, female, softness, water. How fitting that the name ‘Desert Rain’ invokes the concept of yin yang – contradictory yet interdependent, as the house needs the sun for energy and the rain for its water source. The Great Blue Heron is one of the posts adorned with local wildlife images. 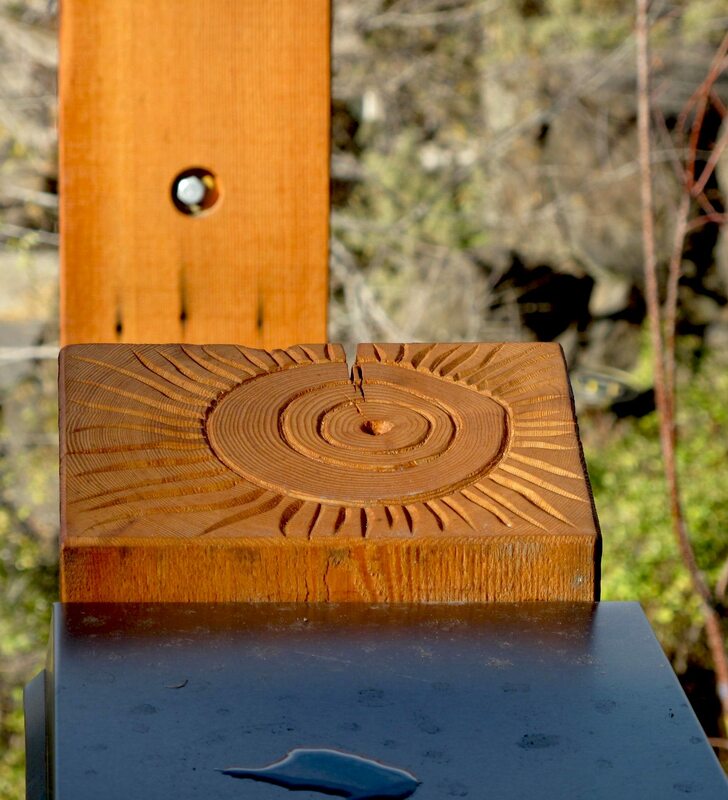 Scott often incorporates hummingbirds into his woodworking and there is one at Desert Rain. Images of other regional wildlife grace the posts -an osprey, rattlesnake, and Great Blue Heron. The resident deer are represented by deer tracks at the entrance. The sense of discovery will be a delight to visitors as they tour the site and find art in the timbers and structures of the landscape. 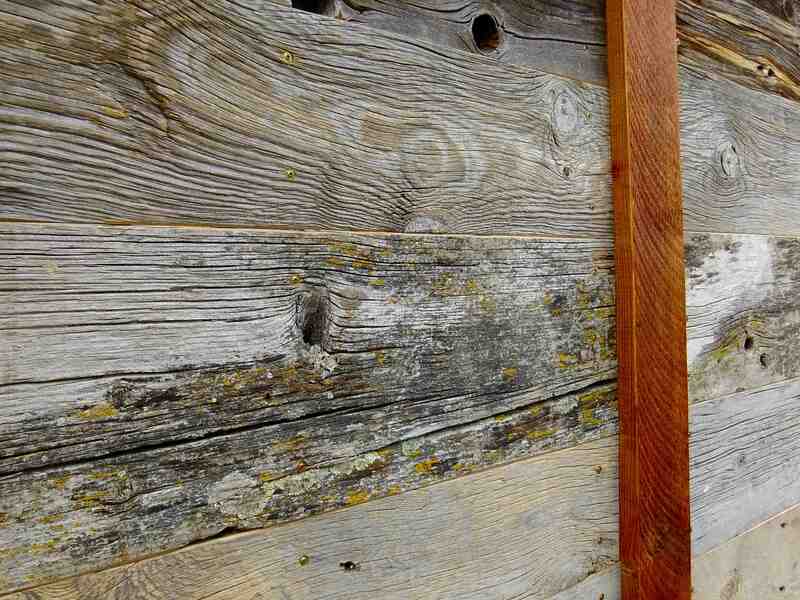 The lichen on the weathered, barn boards may continue to live and grow bringing beauty and nature. Scott had not heard of the Living Building Challenge before Desert Rain. The biggest difference for him with this project was using reclaimed wood. 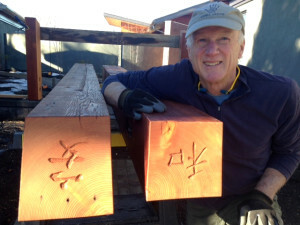 He spent hours sorting through piles of 2” x 12”, weathered, barn boards searching for the right pieces that would sandwich the Forest Stewardship Council certified plywood on the privacy panels. He wanted wood with character; knots, grain, and lichen attached that will hopefully, continue to grow, bringing life and natural beauty to the boards. The challenges came with the FSC plywood that he could not have delivered to his shop as he is not FSC certified. Since the fences and gates are near the last elements to be constructed in the landscape, Scott had a very long wait to begin his work. 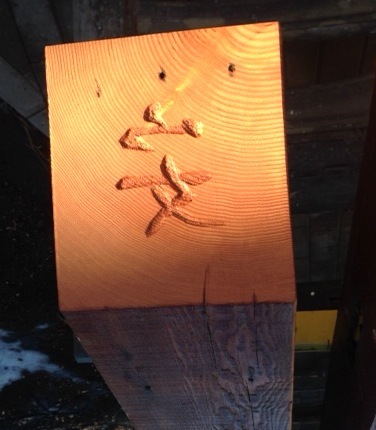 The Chinese character for tranquility is on one of the entrance posts, the other, is harmony. Scott appreciates the artistic license he was given to be inspired by the site, the design, and the project. The top curve of the entrance gate gracefully curves upward. The curve is the same radius as the Miro wall that flows through the structure and into the courtyard interconnecting beauty and design. 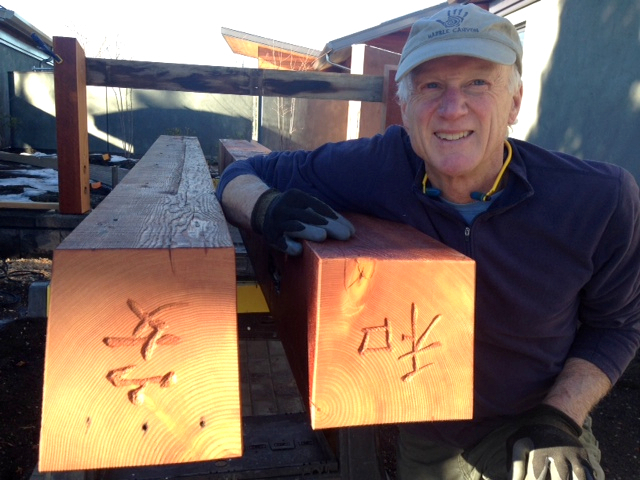 The posts that create the arch are carved with Chinese characters chosen by Scott for their significance to Desert Rain. Everyone who follows the path through the entrance gate will be embraced by Andrew Scott’s artistry and inspiration, into the realm of tranquility and harmony. The entrance arch curve reflects the radius of the Miro wall framing the beauty within. The Chinese characters for tranquility and harmony are on top of the arch posts. Hidden from view, within the walls of Desert Rain is an innovative, structural element composed of Forest Stewardship Council certified wood. The staggered, double wall, framed construction of the building envelope is extraordinary. It was designed and developed to meet the stringent energy standards of the Living Building Challenge . 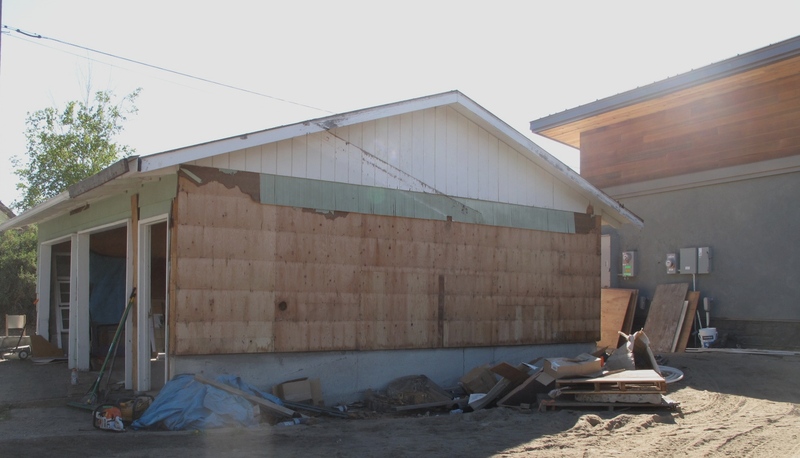 Though the FSC wood is not visible in the building envelope – FSC wood and reclaimed or salvaged wood is abundantly evident throughout the project. 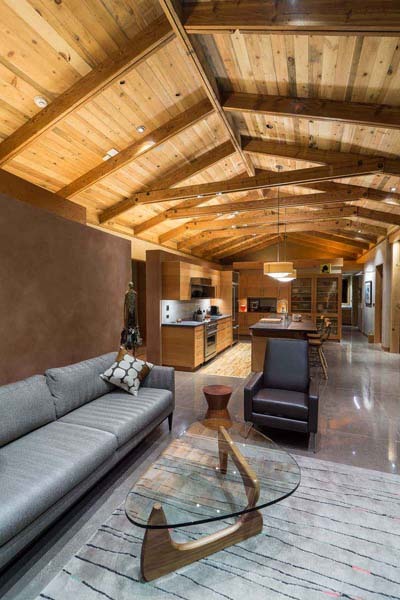 Inside and out – Desert Rain celebrates wood as an integral part of the project. 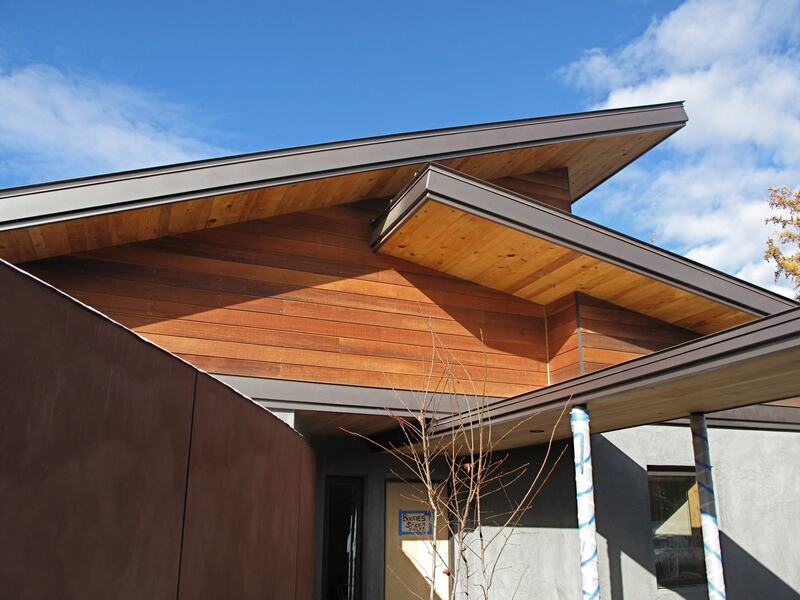 The FSC certified cedar siding glowing in sunlight. 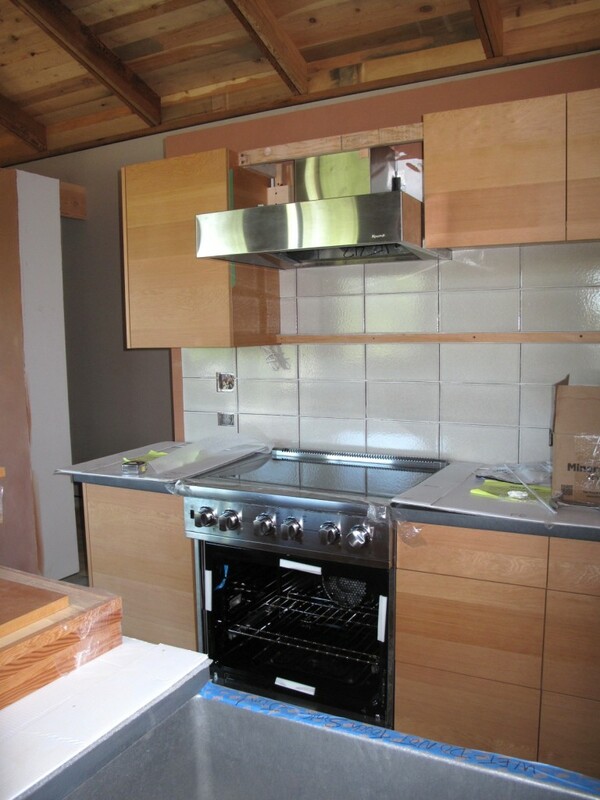 FSC certified wood was used in all the cabinetry. 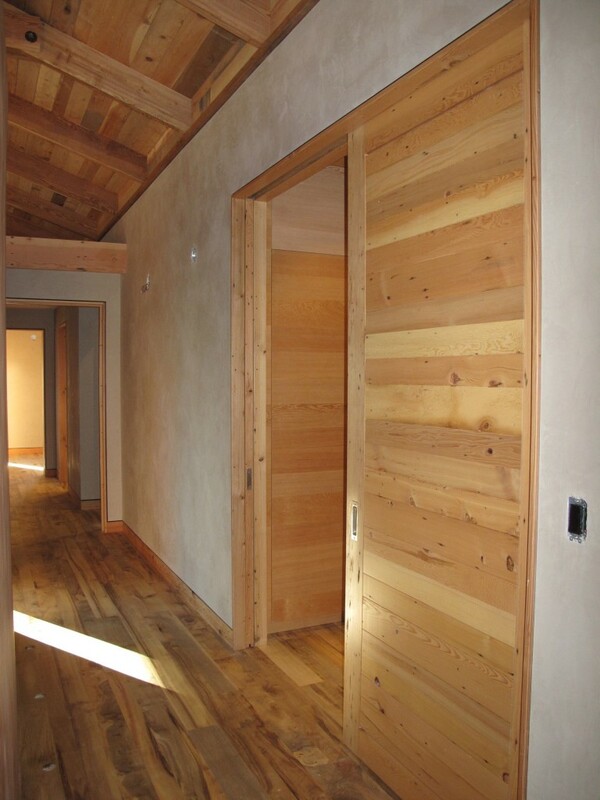 Doors, floors, ceilings, and trim use reclaimed and salvaged wood. Eligible projects, including residential, must use at least 50% FSC certified wood (by cost) of any new wood used. 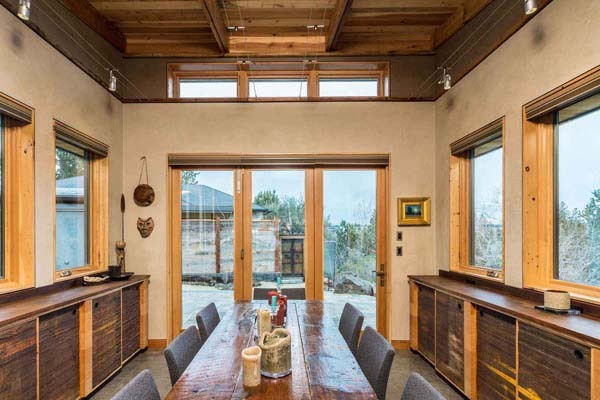 Desert Rain uses 100% FSC certified wood in the structural framing, the cabinetry, exterior cedar siding, and the Loewen window frames. 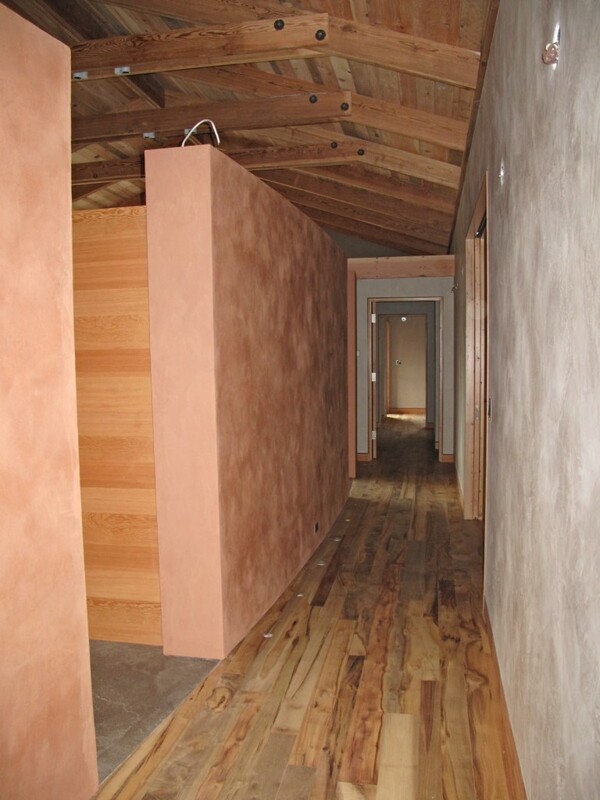 Other woods used at Desert Rain are reclaimed or salvaged. The exterior soffits, interior ceilings, and trim showcase the lumber that was reclaimed from the deconstruction of the two original homes on the site and a nearby, potato barn. 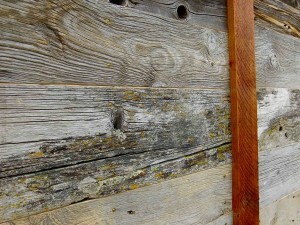 That lumber was re-milled and stored to be used as the construction progressed. The myrtlewood flooring is sourced through Slice Recovery in Coquille, Oregon. Myrtlewood from Slice Recovery is harvested as salvage, a by-product of the timber industry, cleaning up after the logging operations in fir and pine stands. 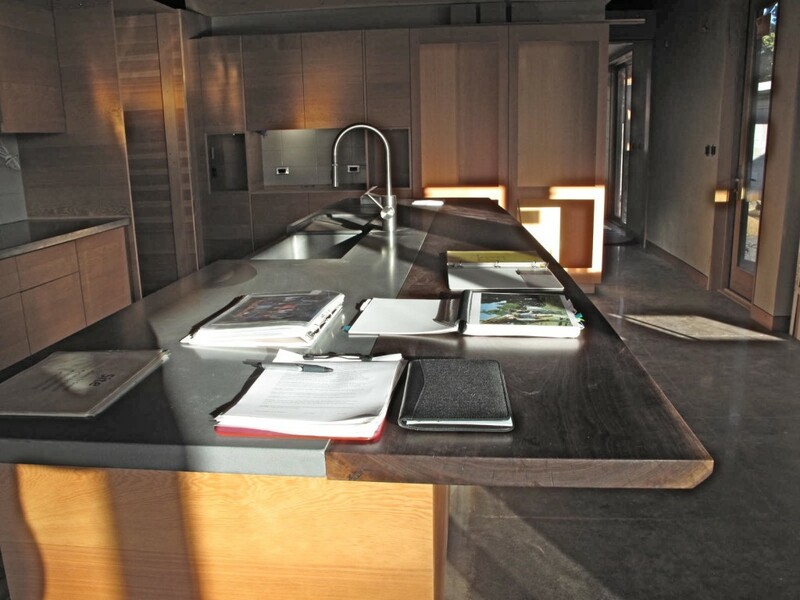 A significant component of the FSC certified wood use at Desert Rain is visually evident in the cabinetry. 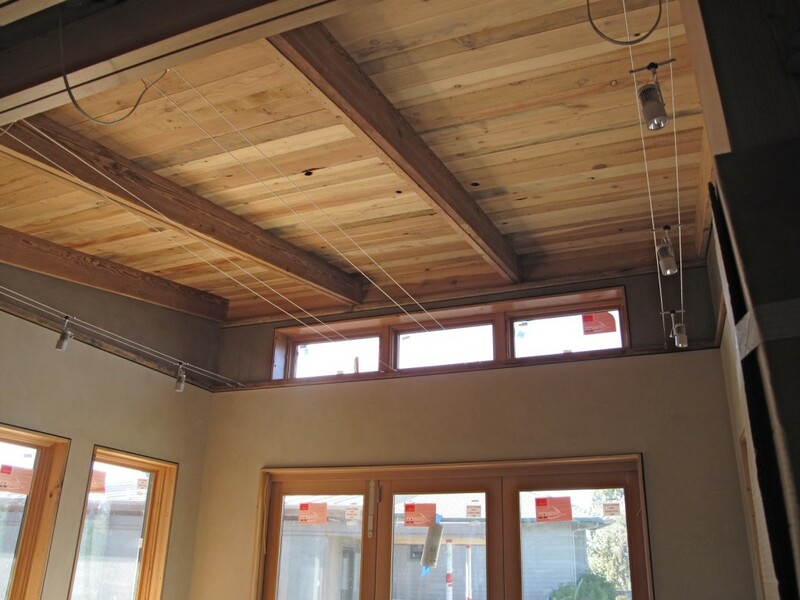 As a Living Building Challenge project, Desert Rain was obligated to use a FSC certified shop and cabinet maker. Owners, Barb Scott and Tom Elliott wanted someone local who understood the design, aesthetics, goals, and challenge of the project. 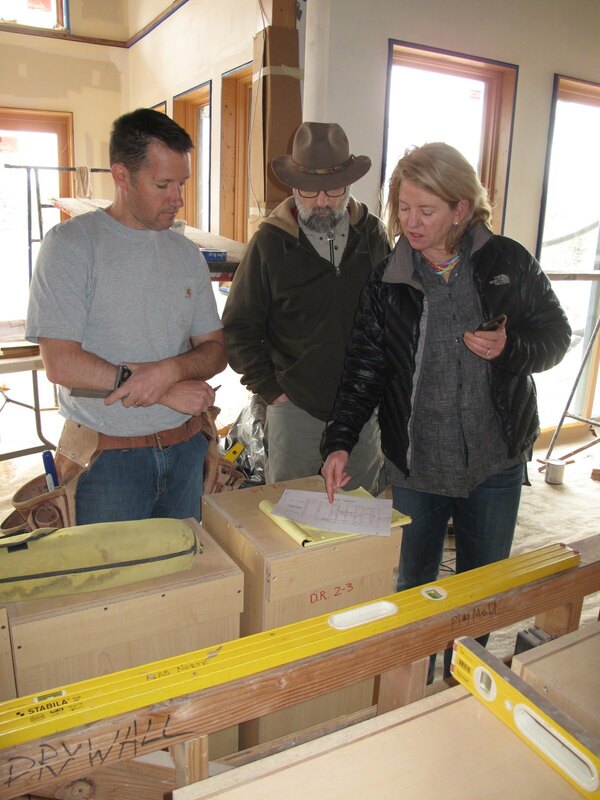 Gabriel Dansky with Dansky Handcrafted, Tom and Barb look at cabinet details. Dansky Handcrafted is a FSC certified cabinet shop. Gabriel Dansky, with Dansky Handcrafted joined the team. 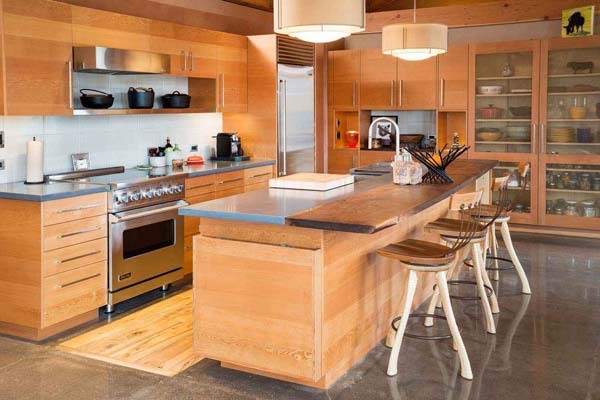 Dansky has been building custom, sustainably minded cabinetry for decades. 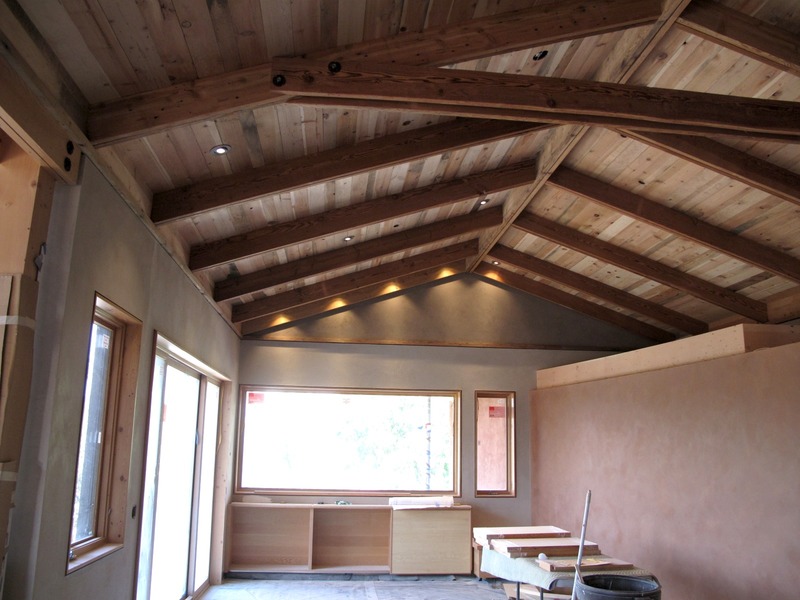 He had used FSC certified wood in other projects. Desert Rain was the catalyst for Dansky to take the next step – becoming a certified FSC cabinet shop. Though the paperwork, auditing, time, and expense of the process could be daunting, Dansky forged ahead recognizing that market demands will drive FSC certification. He sees that people who request FSC wood are generally looking for a quality product that goes beyond price. Cabinets throughout the structure are made from FSC- certified wood. 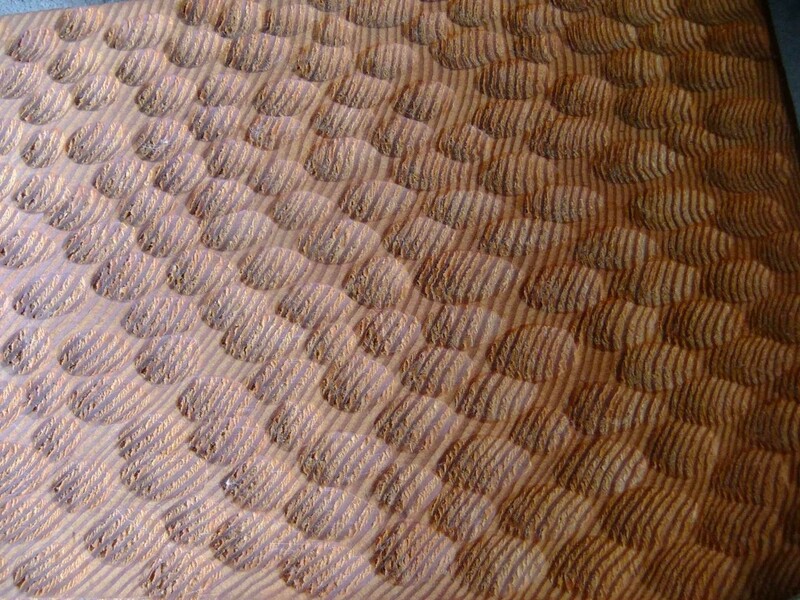 The grain in the veneer is meticulously matched creating visual flow and artistry. Dansky Handcrafted has now renewed their FSC certification to complete the work on Desert Rain. Dansky has embraced the Desert Rain project where he said, ‘everyone can take pride in the quality of their work’. Dansky worked with project designer, Al Tozer with Tozer Design to develop a design that showcases the beauty of the wood. The cabinets are an art form; the veneers are grain matched, flowing, and peaceful as they blend and accent the other elements and materials within Desert Rain. From the structural framing to the finely, finished cabinetry Desert Rain celebrates wood. Wood is an essential and significant ingredient in the function and beauty of Desert Rain. 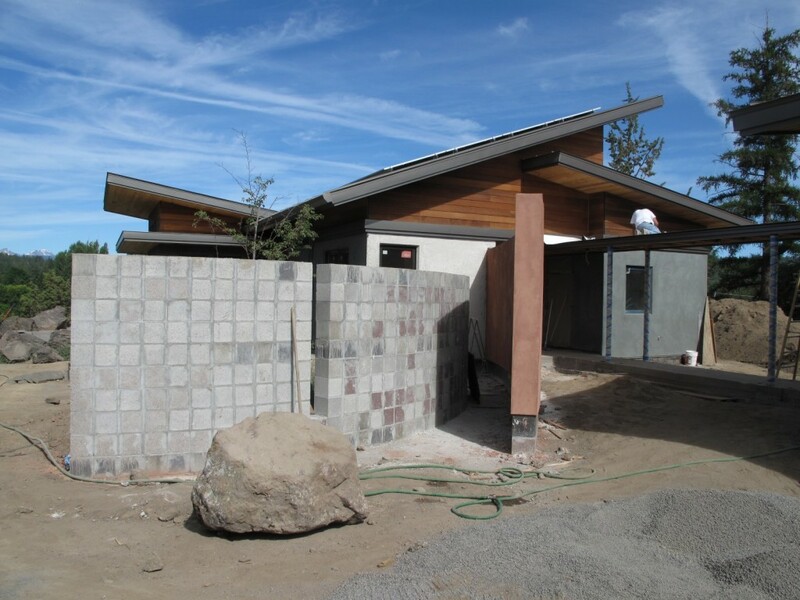 On October 23 notice arrived that Desert Rain was the residential winner for the 2013 Design and Build with FSC Awards. Barb and Tom will soon attend the ceremony to accept the award for Desert Rain and the team. It is time to celebrate – the FSC, good wood, and Desert Rain! Congratulations Team Desert Rain! Wood is an integral and beautiful element of Desert Rain – a cause for celebration! 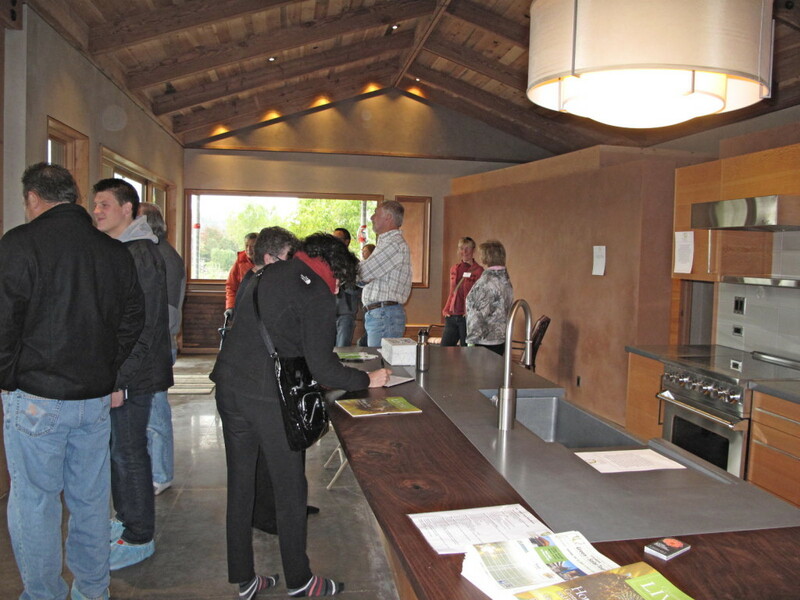 Last Saturday Desert Rain welcomed participants of the Green and Solar Tour. 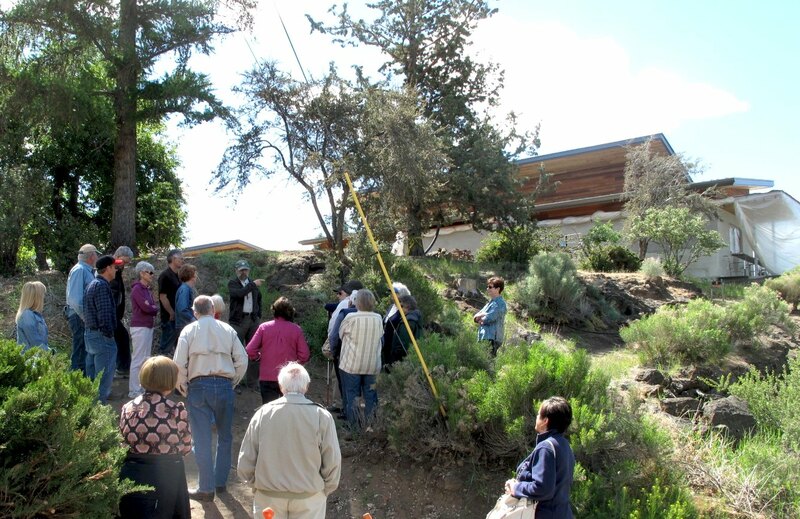 The tour, presented by the Cascadia Green Building Council High Desert Branch included five commercial buildings and five private residences. 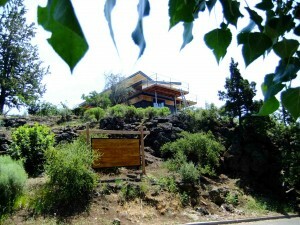 Desert Rain was considered one of the most innovative and energy saving homes on the tour. 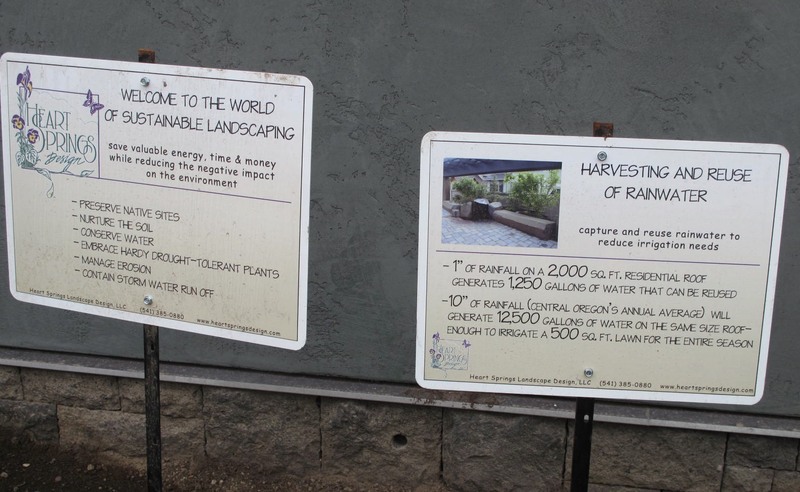 Desert Rain is aiming for third party certification through the Living Building Challenge . 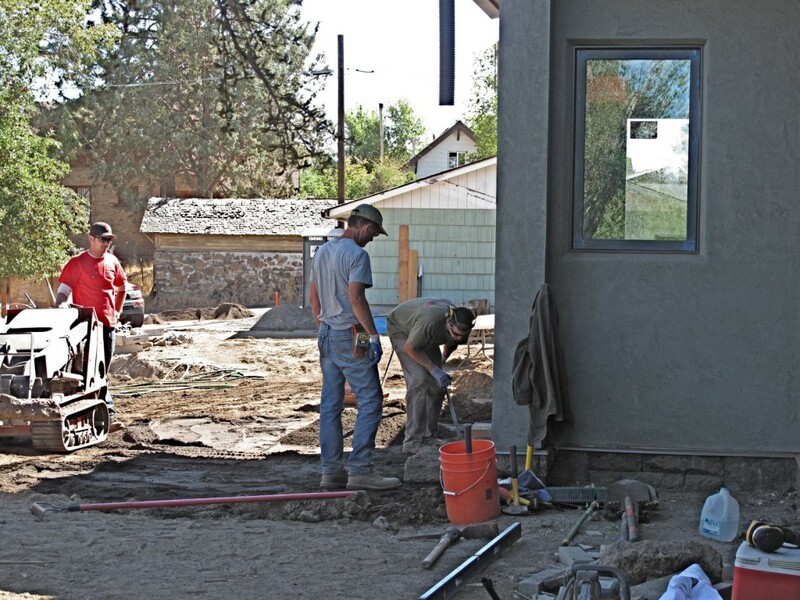 With landscaping well underway, arriving visitors were able to walk on the partially completed paths leading to the main house or to the accessory dwelling unit. 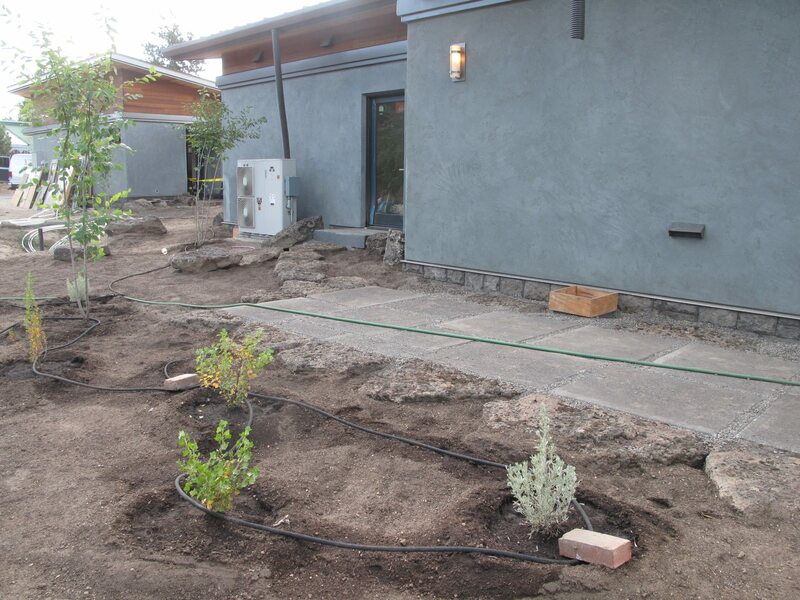 The landscape design focuses on water conservation by using drought tolerant and native plants, permeable pavers and surfaces, and reusing the captured greywater for irrigation. The ‘Miro’ wall gracefully leads into the home and continues through the structure creating continuity between the indoor and outdoor spaces. 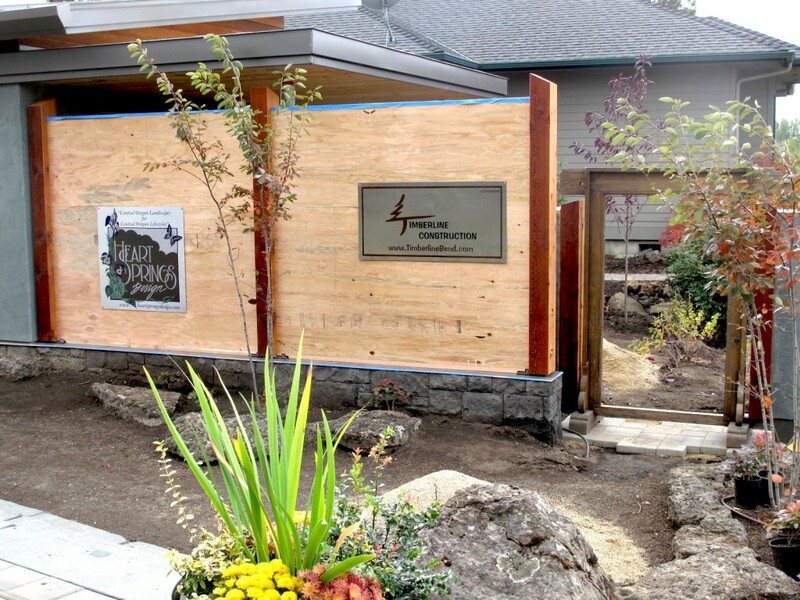 The hardscaping includes the use of lumber salvaged from the ponderosa pine that was removed from the site. 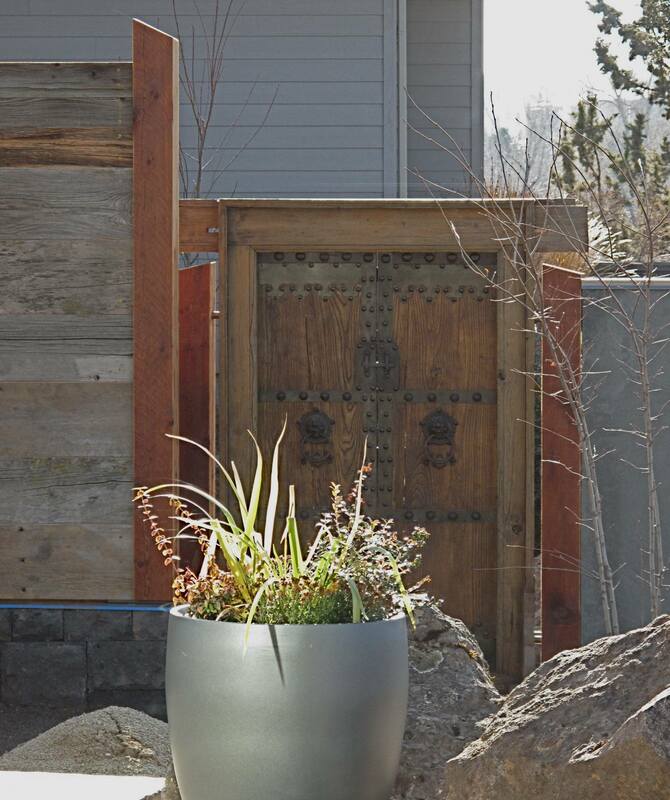 Timbers are incorporated into the privacy fencing separating the accessory dwelling unit from the interior courtyard. 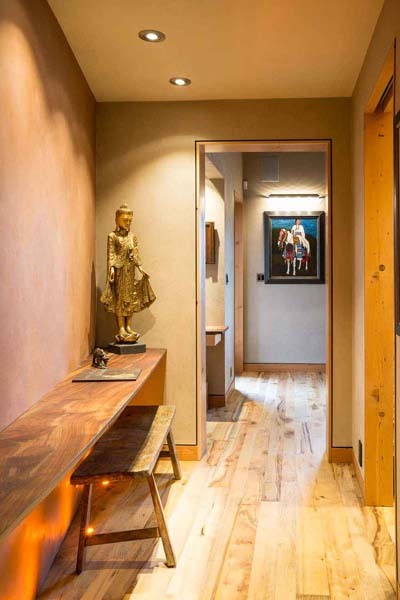 The textures, materials, and natural color tones of the hallway create a welcoming ambience. The American Clay on the walls, salvaged, myrtlewood flooring, FSC and reclaimed woods, and diamond polished cement floors are some of the elements helping Desert Rain achieve the Materials Petal for the Living Building Challenge. 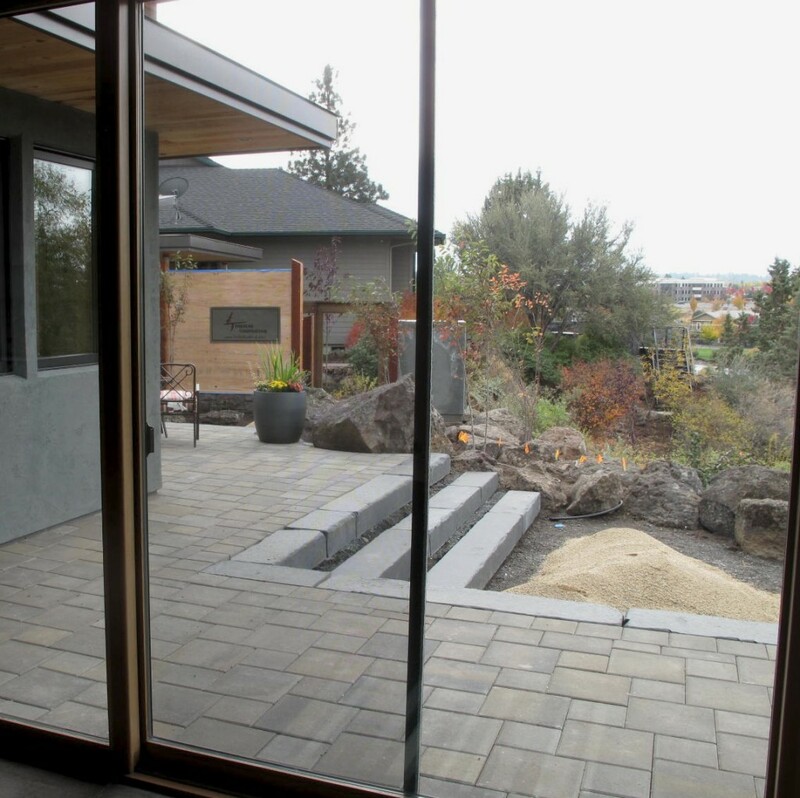 The highly energy-efficient, triple paned, Loewen sliding glass doors open onto the south patio and interior courtyard. As part of the passive solar design, 90% of the windows in Desert Rain are south facing. 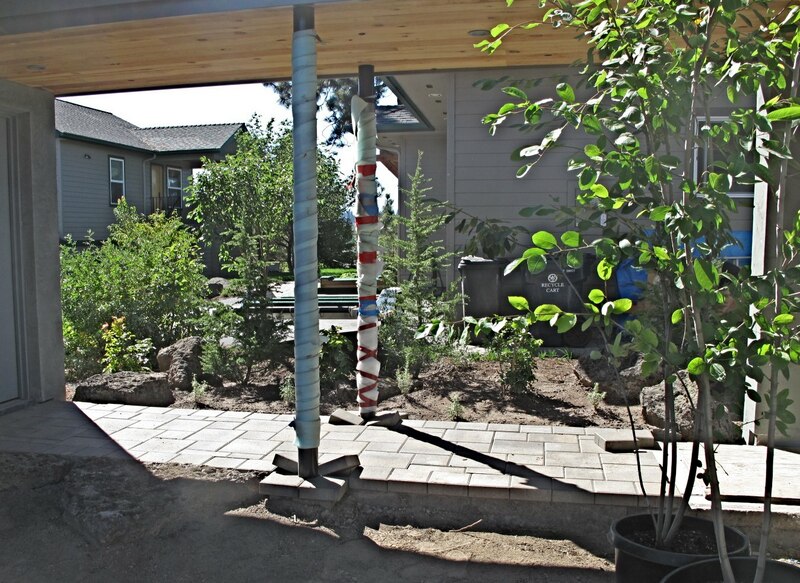 The paving stones and decomposed granite used on the patio and pathways create a permeable surface allowing rainwater to flow through into the soil. All the structures at Desert Rain are designed to maximize roof surface for rain water harvesting. The captured water is filtered and flows into a 35,ooo gallon cistern located beneath the garage where it travels through additional filtering processes before it arrives at the low flow (1.5gpm) faucets. The harvested water will be the source for all domestic water use, including drinking water. Some of the Desert Rain team were on hand to help tell the story of building extreme green. Amy Warren (left) owner of Green Apple Construction and her partner, Josh applied the American Clay plaster throughout the house. Ani Cahill (right) is with Heartsprings Design, the landscape design team. E2 Solar owner, Mike Hewitt explained the 14.8kw photo voltaic modules to interested visitors. 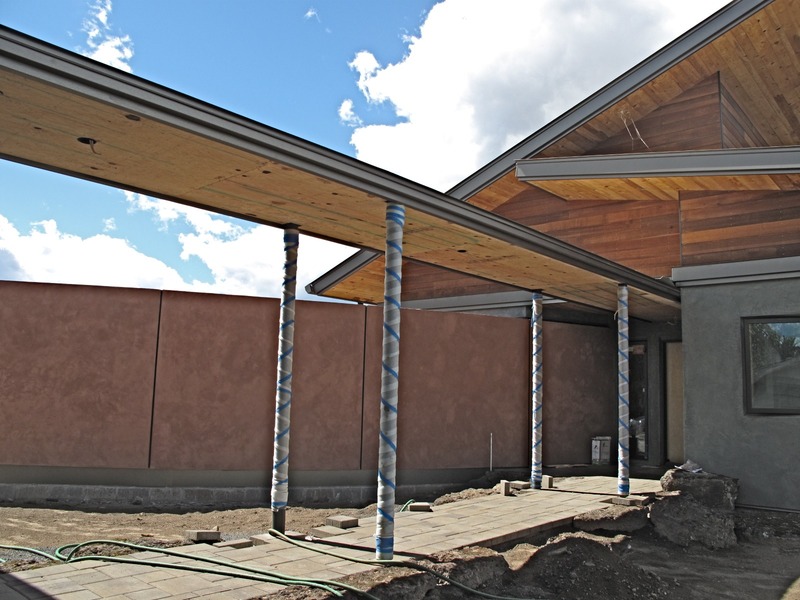 Tom Elliott, owner, Al Tozer designer with Tozer Design, and James Fagan and Kevin Lorda with Timberline Construction answered many questions about the design, construction, materials, and features of Desert Rain. Green and Solar tour participants view, inquire, and admire the elements that put Desert Rain on the ‘bleeding edge’ of sustainability in the built environment. The Living Building Challenge stipulates education as part of the requirements of meeting certification. 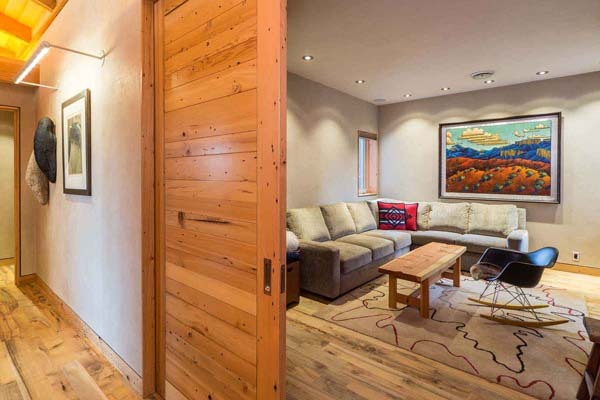 Desert Rain owners Tom Elliott and Barbara Scott have put out the welcome mat for a multitude of visitors during the past 3+ years that the design and building process has been underway. They recognize that Desert Rain is their dream and a demonstration project. Their hope is that each visitor will go away with ideas, inspiration, and awareness for what is possible. Desert Rain has undergone many changes in the past year. Desert Rain has undergone a major transformation in the past year since the last Green+Solar Tour. 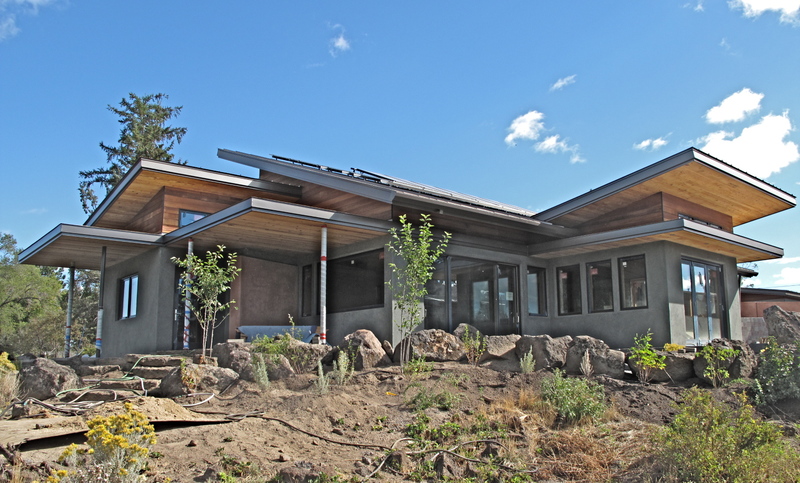 Please join this year’s tour to see for yourself this extreme-green home striving to meet the rigorous standards of the Living Building Challenge. 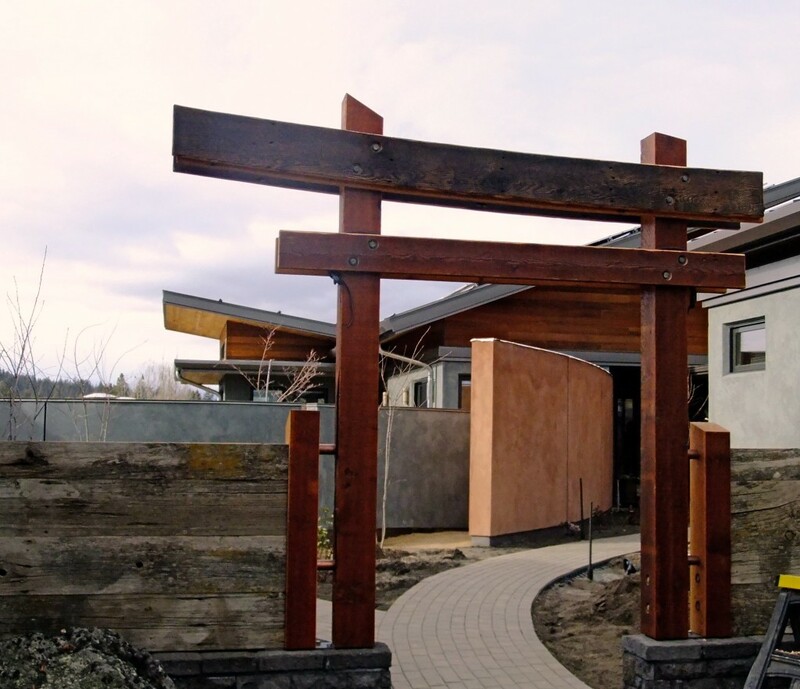 The High Desert Branch of Cascadia Green Building Council is proud to present Central Oregon’s 13th annual Green and Solar Tour. We are excited to highlight both commercial and residential projects that exemplify sustainable choices both for new construction and remodels. Check out the Tour website CLICK HERE and FACEBOOK PAGE HERE . 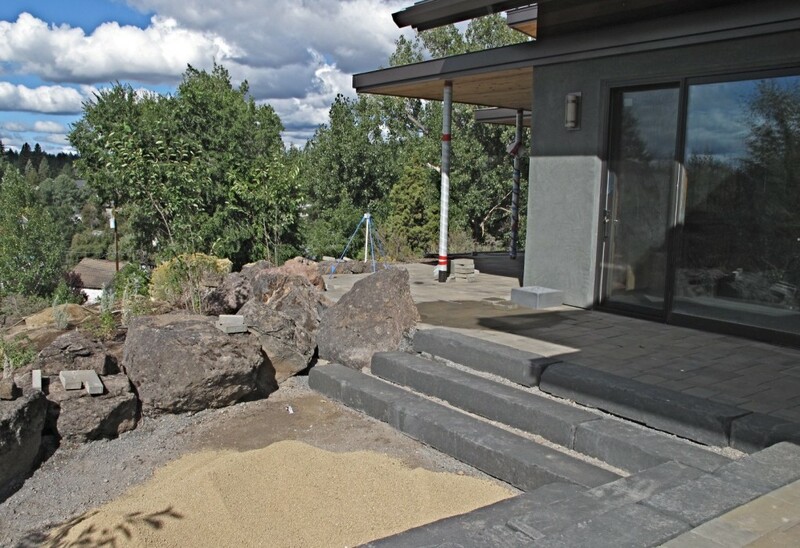 The south patio with pavers, rocks, and basalt steps. This Tour, which is free to the public, has historically drawn some 700 people through the doors of highlighted projects. With this Tour, we are helping Central Oregon realize tomorrow’s living future through the sustainable choices and actions we make now. Tour starts with a Kick-Off event with informational tables and exciting keynote speakers at COCC’s Health Careers Building. Doors open at 8:30 a.m. with first Keynote Speaker at 9:00 a.m. Homes and commercial buildings are open at 10:30. About Cascadia Green Building Council: Cascadia is a chapter of the US Green Building Council and the Canada Green Building Council, with offices in British Columbia, Washington and Oregon. Cascadia’s mission is to lead a transformation toward a built environment that is socially just, culturally rich and ecologically restorative. The Desert Rain owners and team are pleased to be part of the 2013 Green+Solar tour. Welcome! 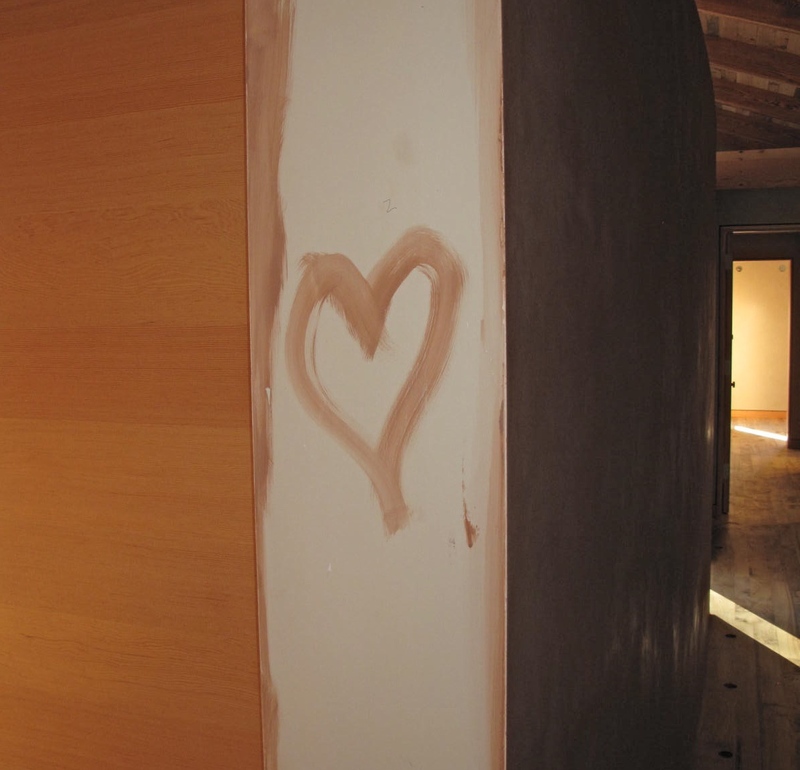 A message left by the American Clay Plaster crew, Amy and Josh, sums up the team spirit at Desert Rain: it is a project of labor and love. The deconstruction of the original garage begins to make room for Desert Lookout. The garage from the original homes on the Desert Rain site is in the process of deconstruction to make way for Desert Lookout. The new structure will have an office/apartment, a garage, a yoga studio, and will house the composting/evaporator unit for blackwater. Engineering and the permitting process is still underway for the blackwater systerm. Materials from the old garage will be salvaged when possible. The concrete slab will be broken up to be used as patio stone in the landscaping. The old garage has been deconstructed to make way for Desert Lookout. The concrete slab will be broken and reused as landscape pavers. Daniel Balyeat, Henry, and Jeremy have been working on pavers, walkways, and patios. 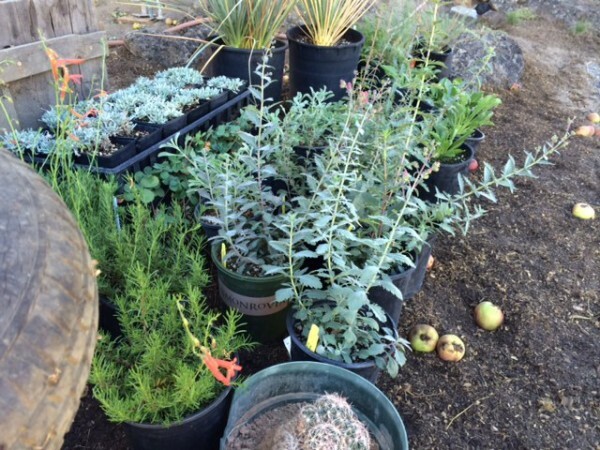 After months of excavation, dirt piles, holes, and dust – plants have arrived and Daniel Balyeat, owner of Balyeat Landscaping, and his crew are amending soil and planting. The vegetation is bringing new life to the site, softening the edges of construction and adding a glimpse of the courtyards, gardens, and pathways that will grace the grounds. In addition to the stones that were salvaged from the deconstruction of the original structures on the site, large rocks were rescued from a construction project and hauled to the site to be used as paths and borders. The north side of the main house with reclaimed concrete patio and new plantings. The covered walkway between the garage and the house with pavers and border stones in place. The ‘Miro’ wall is in the background. The landscaping plan utilizes a large selection of drought-tolerant and native plants. The Living Building Challenge requires that 35% of the plant material on the site must be edible to either humans or wildlife. In addition to the apple trees that were saved from the original homesite, there will be an area devoted to raised beds for vegetables. A good portion of the edible plants will provide berries and fruits for wildlife. The boundry between the accessory dwelling unit and the neighboring property is narrow and shady requiring a plant selection chosen for screening properties and size. Pavers are in place for the driveway to the ADU garage. 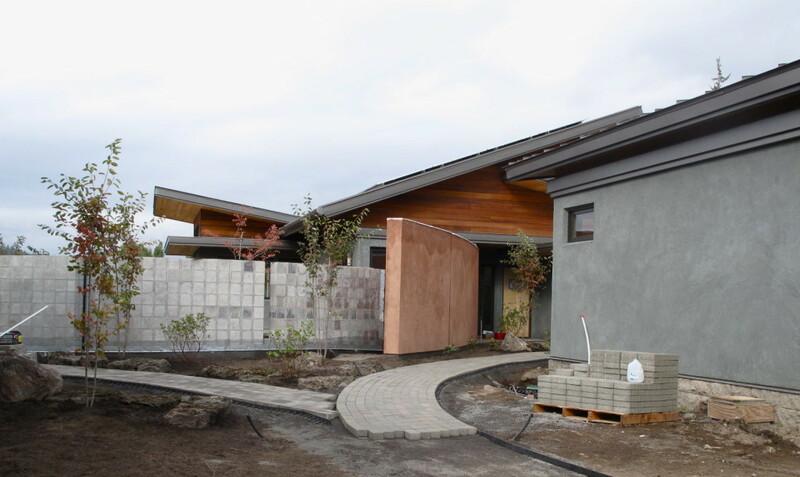 Desert Rain as viewed from the southwest with the exterior near completion – paving stones, pathways, and plants in place. 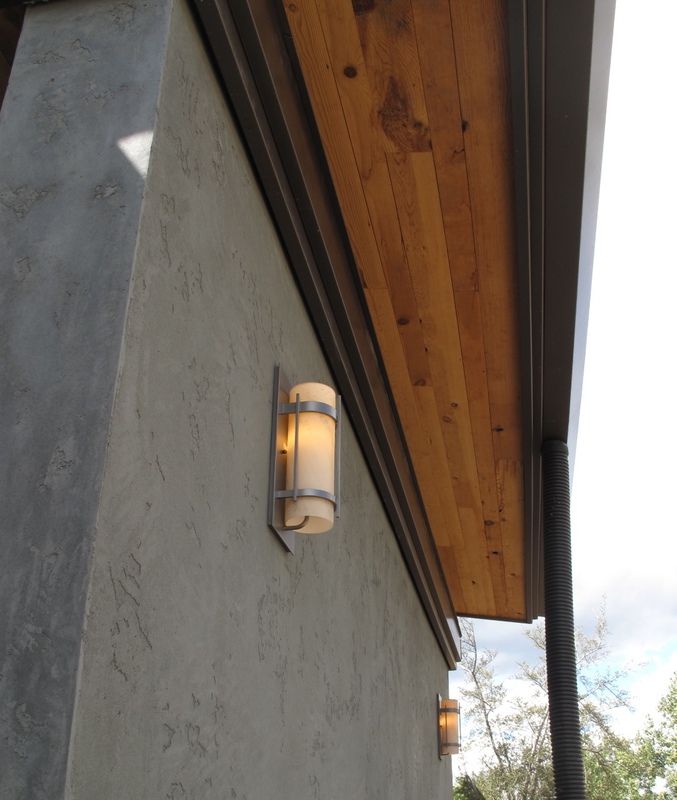 Exterior LED lights on the north side of Desert Rain accent the beauty and texture of the lime plaster and reclaimed wood soffits. Mountains of dirt have been leveled and moved. Moss covered rock and stones have been carefully set in place. Piles of pavers and reclaimed rock have been transformed to pathways and patios. 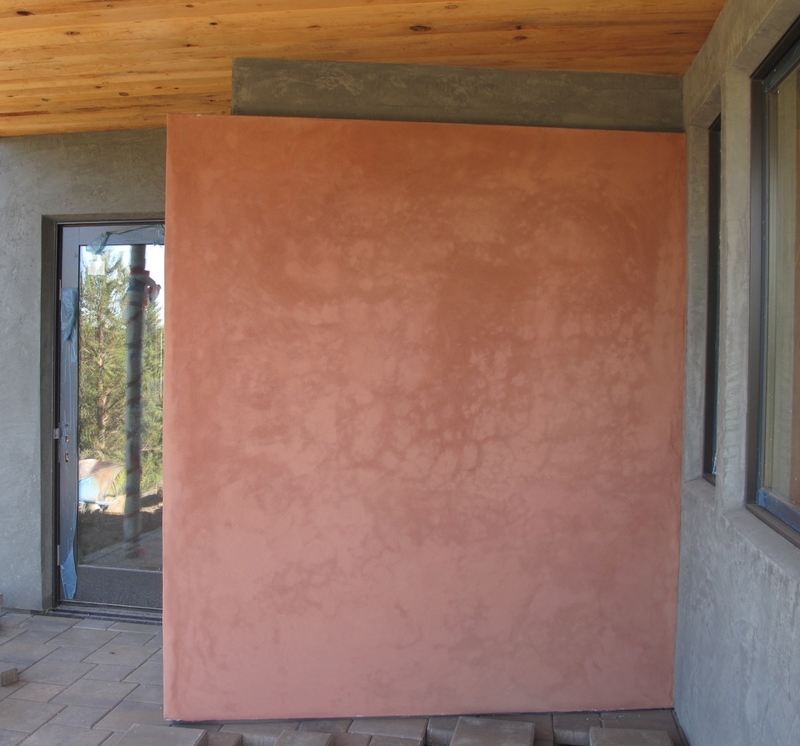 LED lights have been installed outside creating a warm, glow on the texture of the lime-plastered wall. 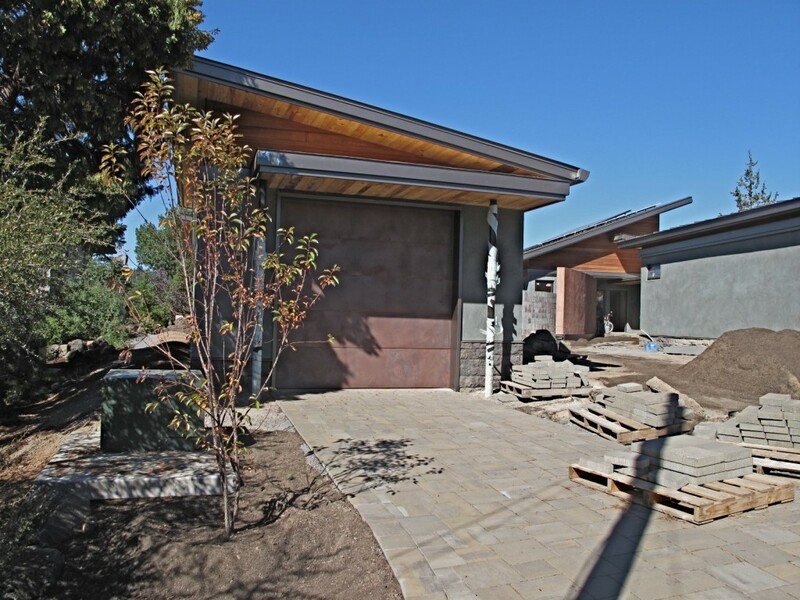 Trees and shrubs are placed to provide privacy and create a sense of nature.As exterior elements are being completed, it is evident that the beauty and detail that have set the standard inside Desert Rain is gracefully flowing outward. Every trip to the Desert Rain site reveals changes and surprises as many aspects of the project are coming together and nearing completion. Color and texture abounds in the materials inside and out. 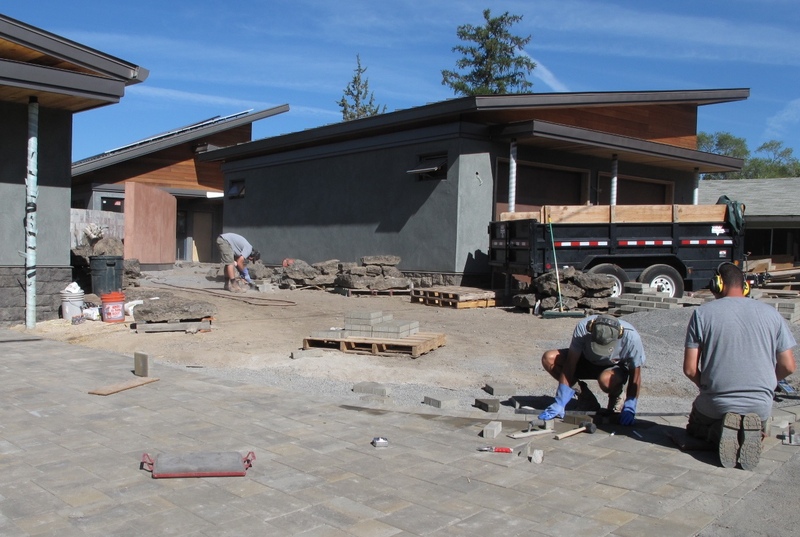 The landscaping is underway with pavers, boulders, and gravel being installed. It is getting easier to walk about the site as holes get filled and ground is leveled. Electrician, Mike Wagnon has been diligently installing the LED lighting system throughout the project creating a warm glow. The myrtlewood flooring in the main house is being sanded. 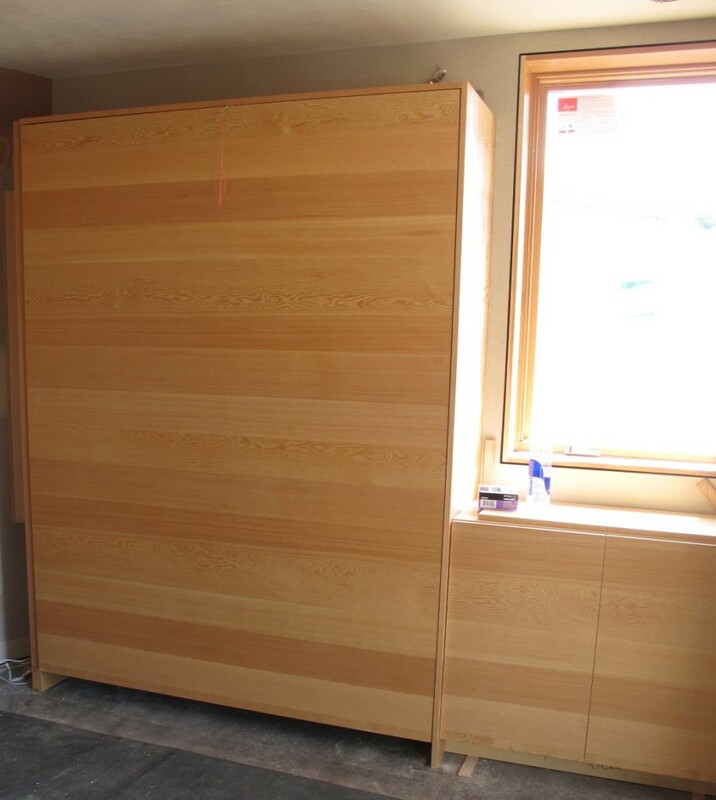 Many of the cabinets and built-ins are in place. Tile is up and grouted. Browse the photos for a current peek at the progress. We are working on a new photo Gallery page for the website that will keep you updated. Please check back and visit our Gallery/ New Progress. 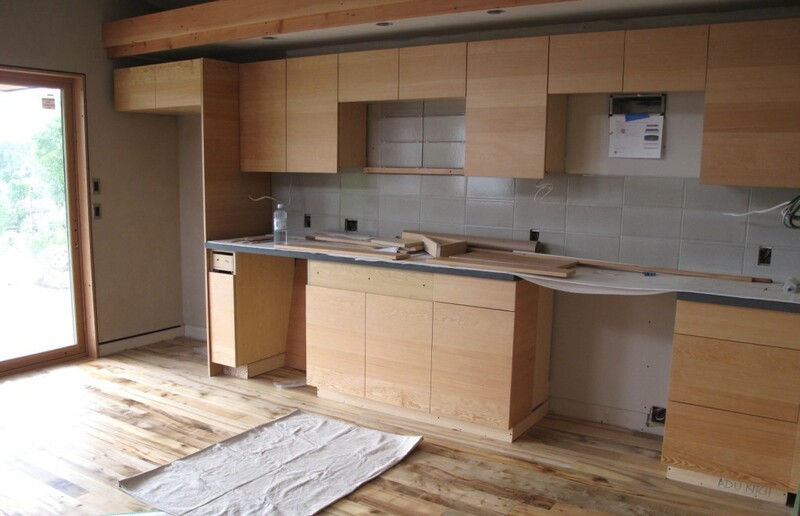 The kitchen area in the ADU with FSC wood cabinets, salvaged myrtlewood flooring, and recycled backsplash tiles. The living space in the main house showing the reclaimed wood ceiling in the glow of the LED lighting. 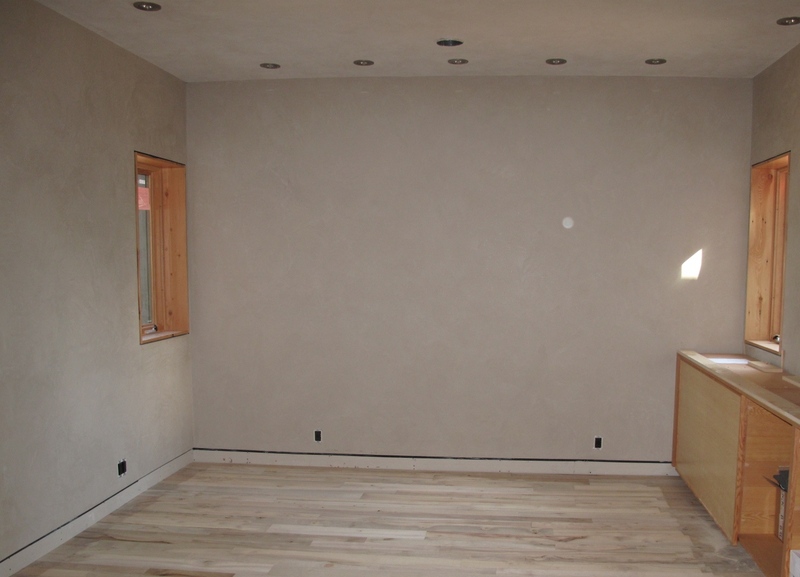 The den in the main house with American Clay wall covering, salvaged myrtlewood flooring, and LED lighting in place. LED lighting system currently being added in the dining area. 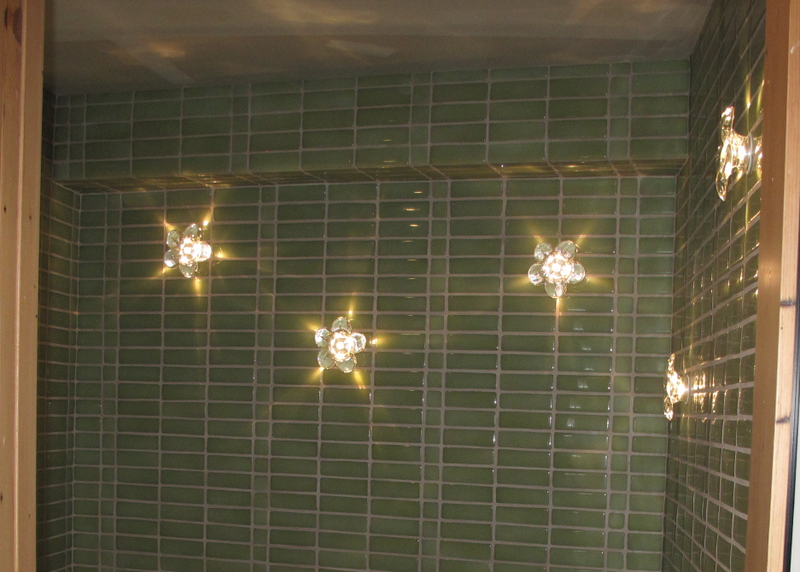 LED flower lights create ambience in the guest bath with light reflecting in the recycled, glass tiles. Appliances are in place in the main house kitchen. FSC wood cabinets and recycled material tiles. Hardscaping is underway outside with installation of pavers and driveway. 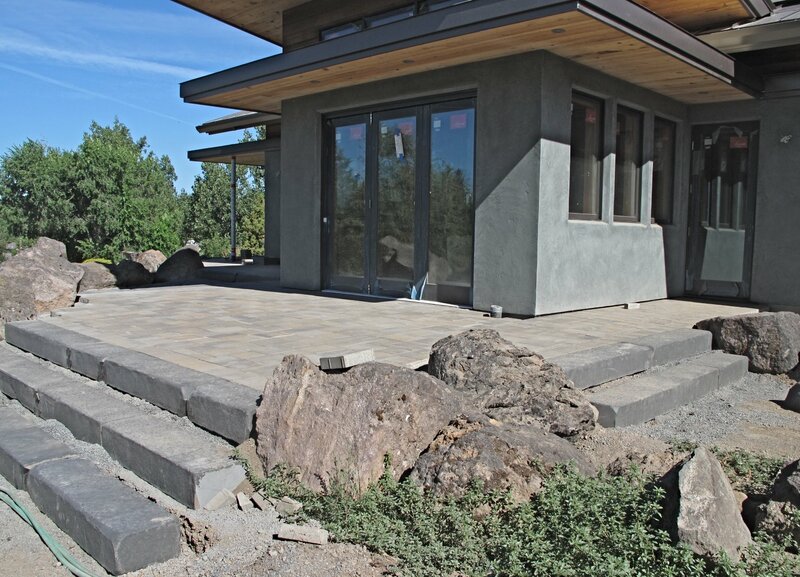 The south patio with basalt steps, boulders, and pavers in place. 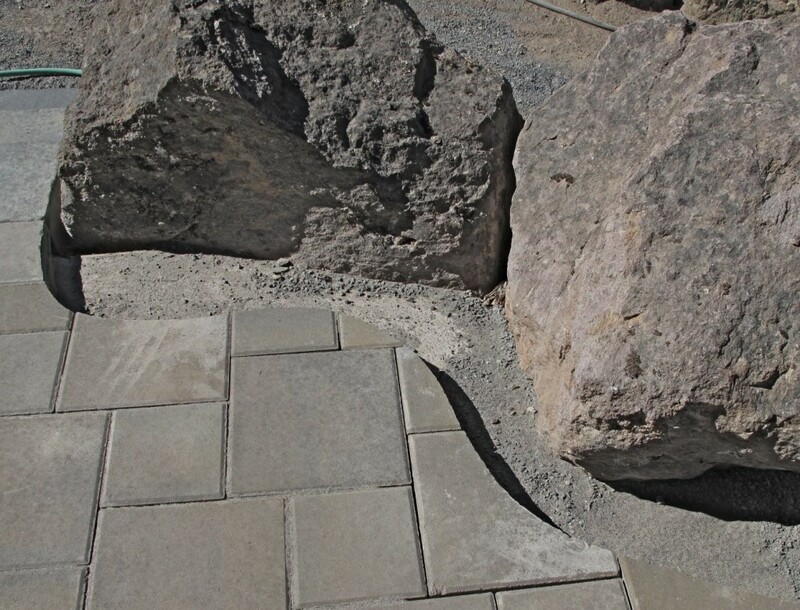 Attention to detail: the pavers have been cut with graceful curves to accent the boulders. 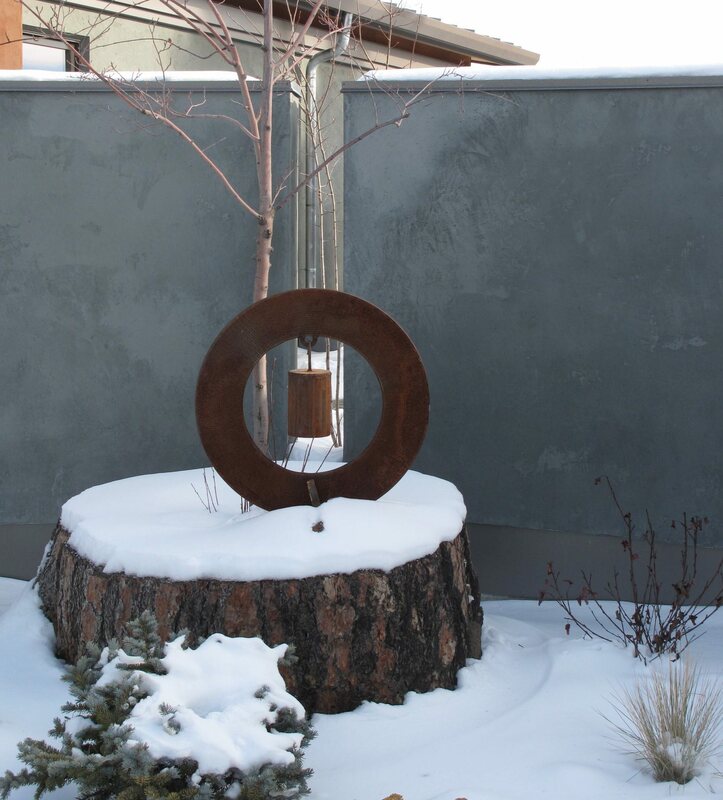 The first art in the garden is placed at the memorial planting for the ponderosa tree that was removed before construction. Beautiful contrast of earth tones, light and reclaimed wood on the west patio. 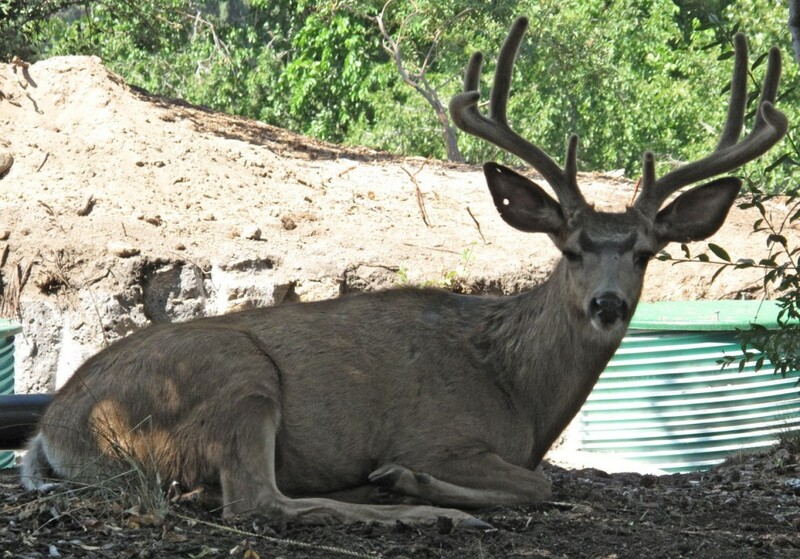 Excavators and people don’t seem to bother the resident buck as he takes an afternoon siesta under the apple tree. 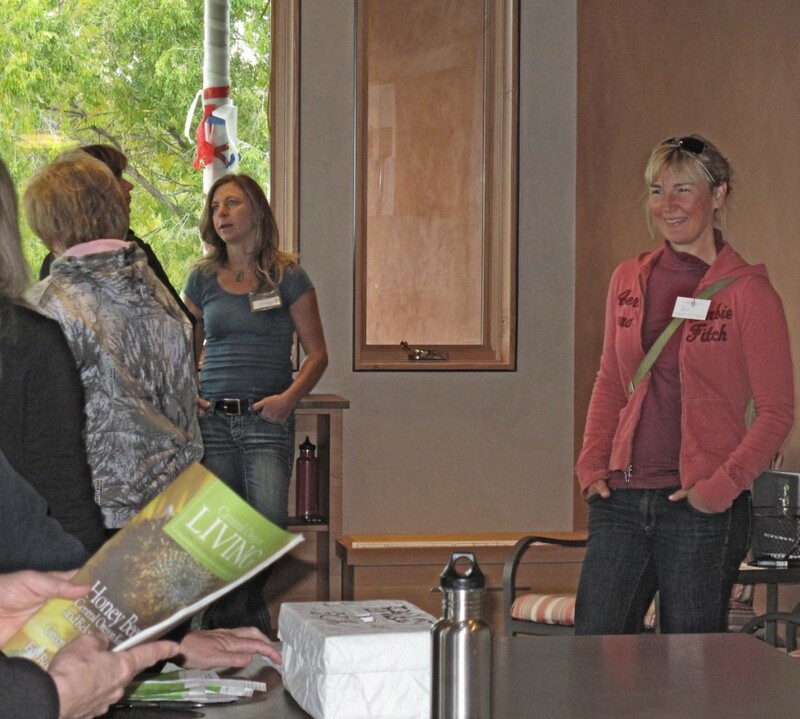 Would you like to learn about the Living Building Challenge? Would you like to see the structures, systems, materials, and components that make Desert Rain an ‘extreme green’ project? Would you like to meet the owners and hear how the dream began? Join us for the upcoming tour and Living Building Challenge orientation presentation by ML Vidas, the LBC consultant for Desert Rain. Pizza and drinks will be served to accommodate the lunch hour and our passion to propagate any and all of the LBC. 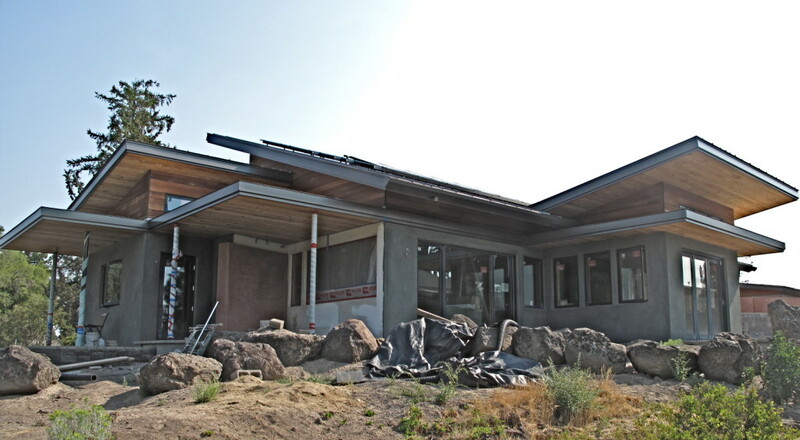 The Living Building Challenge is the built environment’s most rigorous performance standard. Desert Rain House located in downtown Bend, is one of the world’s first residential candidates for certification under the international Living Building Challenge standards. 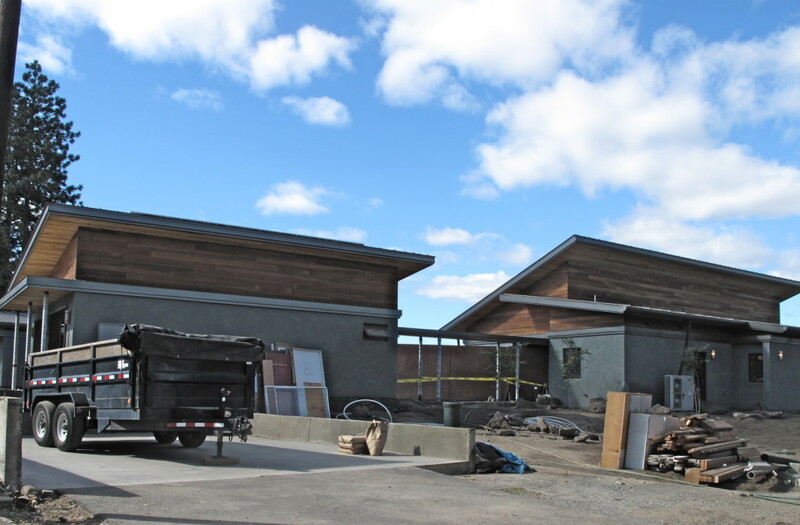 This residential compound,comprised of 5 structures is nearing completion and will be entering a 12 month Living Building Challenge audit phase.